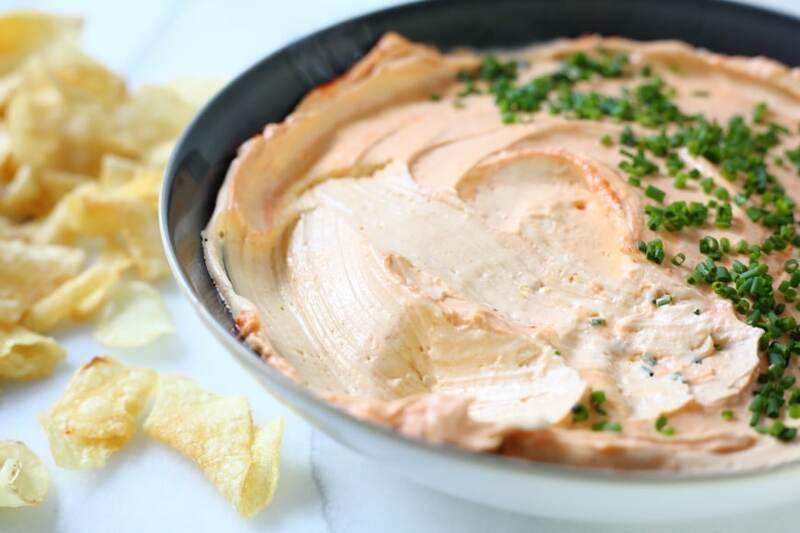 This spicy sriracha cream cheese dip is the ultimate party appetizer, and it comes together in just minutes! 2018 update: new video below! News flash: apparently there is a big football game on TV this Sunday! OK, OK—I do know that the Super Bowl is this week. Just don’t ask me who’s playing. I grew up with two older brothers and a Dad who were/are crazy about football. First downs, touchdowns and field goals were the sounds of our Sundays, even though I inevitably had my nose stuck in a book and didn’t know what any of it meant. 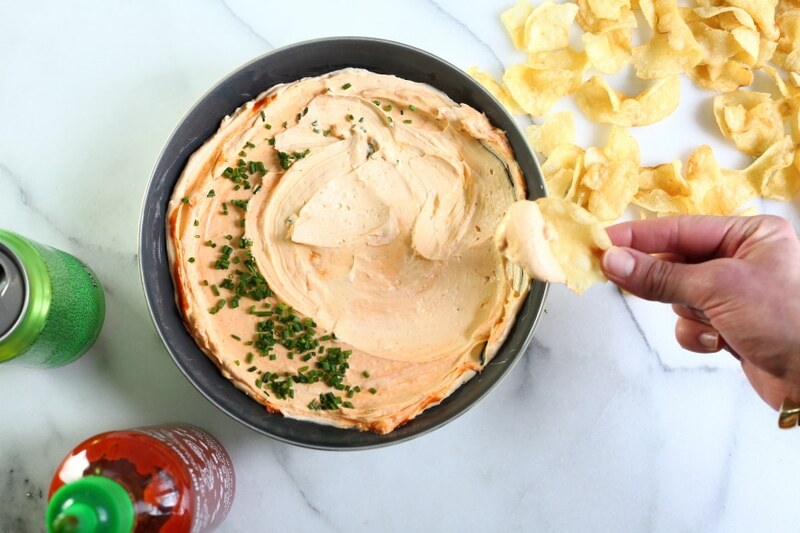 While I still can’t distinguish a quarterback from a lineman, I would happily sit through any game as long as I had a bowl of this sriracha cream cheese dip in front of me. 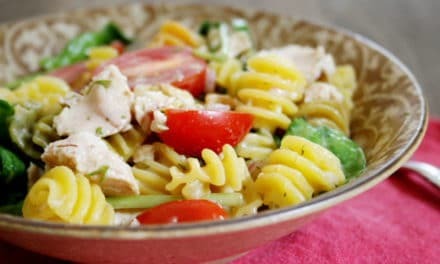 The recipe comes from my new cookbook by way of my good friends Kelley and Amanda. They also grew up in Illinois and are die-hard Bears fans. For years they’ve been making this dip (which is a modernized version of one Kelley ate growing up) on Sundays during Bears games. When their son was a toddler, they randomly made the dip on a non-football day, and he cried, “I don’t want to watch GO BEARS!”, thinking he’d be coerced into watching football yet again. From there, the name “Go Bears Dip” stuck. 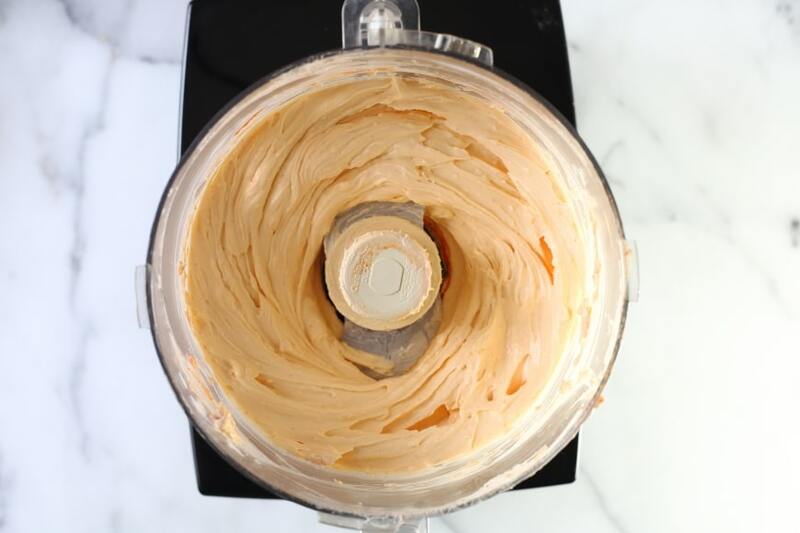 It’s insanely simple to make (4 ingredients! ), but insanely addicting to eat—spicy, creamy, garlicky and oh-so-perfect with potato chips. It will convert you into a football fan, or—warning—distract you if you are one. 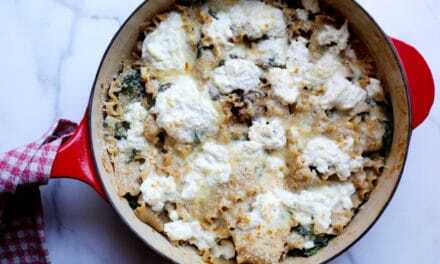 Adapted from The Food Processor Family Cookbook , by Nicki Sizemore (Sonoma Press © 2016). My good friends Kelley and Amanda are avid Chicago Bears football fans. 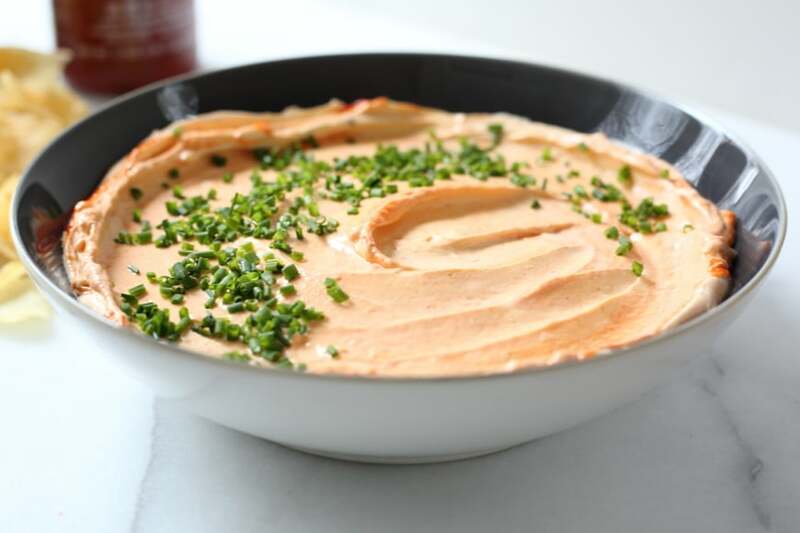 They started making this simple but insanely addictive dip to nosh on while watching the games. Their son started calling it “Go Bears!” dip when he was a toddler, and the name has stuck. 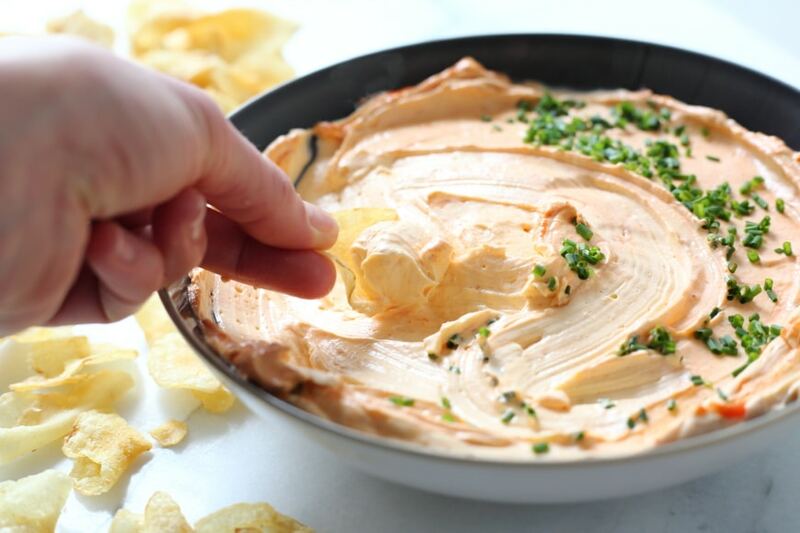 While I must admit that I’m not a football fan, this dip is enough to get me to watch a game—at least until the bowl empties. 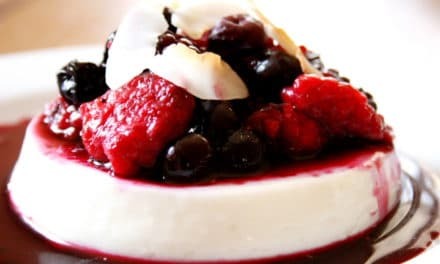 The recipe can be halved, by the way, if you’re not serving a crowd. In a food processor with the motor running, drop the garlic through the feed tube to chop. Add the cream cheese, sour cream, and 2 tablespoons of sriracha, and season with salt. Process until smooth, stopping and scraping down the sides occasionally. Taste and pulse in an additional tablespoon of sriracha, if you prefer it spicier. Transfer to a bowl, and drizzle with more sriracha. Sprinkle with chopped chives, if you wish. 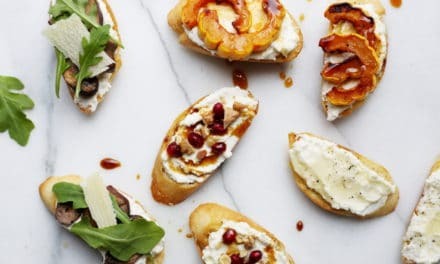 Serve with potato chips for dipping. 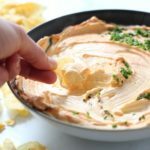 The dip can be refrigerated for up to 5 days. Bring to room temperature before serving. PreviousMake the Most of Your Blender Class Now Online! NextCookbook and Food Processor Giveaway! Really good! I didn’t have any chips. So I spread it on low carb tortillas, rolled them, chilled the, then cut in to pieces to serve. Yum. BRILLIANT!! I love this idea. Thank you for sharing!